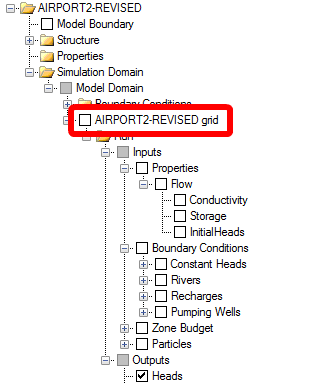 After you have created a grid or imported a grid (and associated model), you will be taken to the View/Edit Grid step. There are several options available. 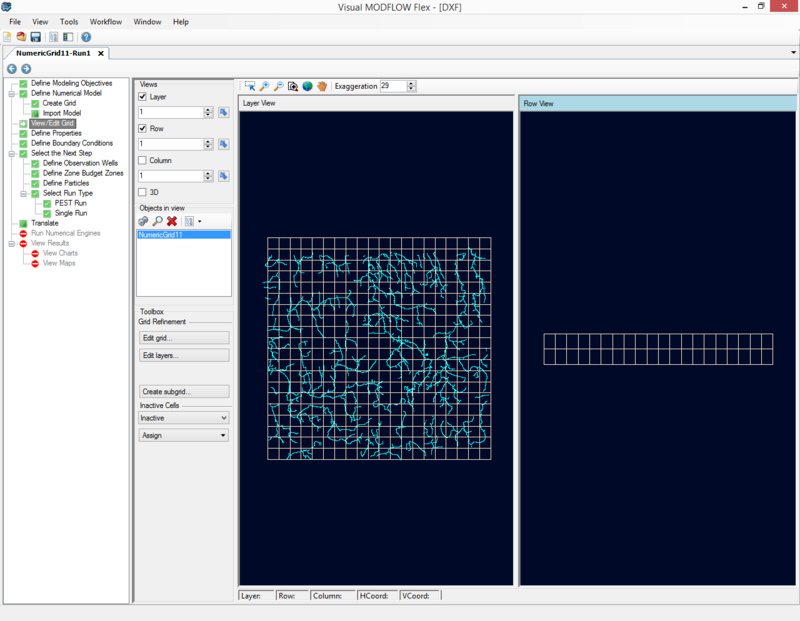 •Under Views, select the various views you want to see in the Flex viewer; Visual MODFLOW Flex allows you to simultaneously show a layer, row, column and 3D Views. •Adjust a specific layer, row, or column using the up/down arrows or enter a specific row, column, or layer integer. Alternatively, click on the button then click on any specific row, column, or layer in any of the 2D views, and the selected row, column, or layer will be set automatically. You can right-click on the numerical grid in the Model Explorer and select Settings. In addition, the Numerical Grid can be added to a stand-alone 3D view; to do this, right click and select 3D Viewer. There are several other options available on the right click menu. 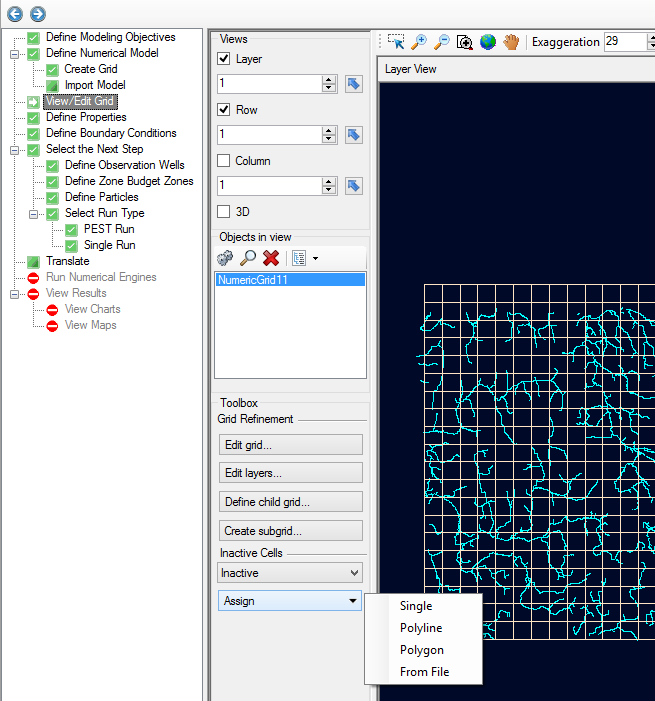 The numerical grid can be exported to shapefile; see Export for more details. •Export Layers: allows you to export the layers of the grid to .txt or .csv file. These files can be edited and then imported back. 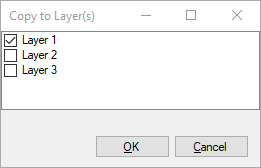 •Import Layers: allows you to import back the layers you exported (and edited). 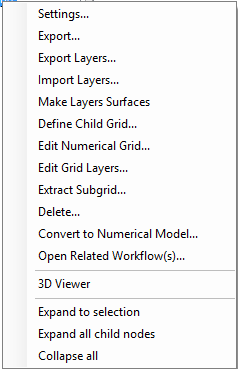 You will also find the option to "Make Layers Surfaces" which will create a folder in the Data Explorer (named: grid name Layers Surfaces) where you will find that surfaces have been created for each layer starting with Top, followed by Bottom.001, Bottom.002 etc. In the toolbox under the Grid Refinement section you have options to Edit Numerical Grid...... (horizonal) Edit Grid Layers... (vertical) as well as Define Child Grid (for LGR) and Extract subgrid. •Use the left mouse button to start drawing in the grid view, and add highlight the desired cells; for single cell selection, a point will appear on top of the selected cell. •Once you have finished digitizing, right click with the mouse and select "Define Attributes" (or click on the "Finish" button under the toolbox); the following window will appear. •The selected cells will be set as Inactive or Active, depending on the option you have selected. Inactive cells will be colored turquoise. When you are finished with viewing the grid, click (Next Step) to proceed to the Define Properties step.